Brian's "Picture of the Month"
One of the most amazing things that I have ever seen! 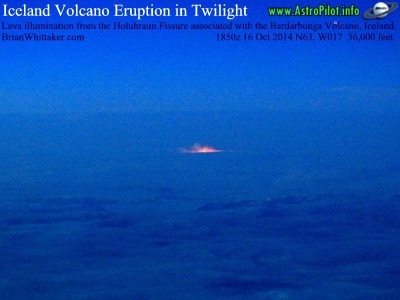 From 150 miles away, 75 miles out into the Atlantic Ocean, I noticed the distant glow on the clouds from a lava eruption on Iceland [wiki]. Even though I was aware of its current status it still managed to surprise me. Apparently it had already reached the status of being the largest eruption there for 100 years, but remains mostly unknown because of its remoteness and current insignificants to anyone else. Trust me, if this was anywhere else in the world near a significant population, it would be the number one nightly news story everywhere on the planet, day after day! The reddish-orange glow got significantly brighter as I got closer to a minimum distance of 75 miles. 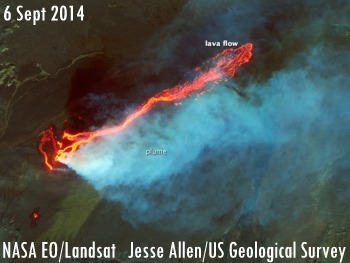 For the first time I was seeing a new source of light: Astronomical (sun, moon, stars, aurora), Natural: (lightning, forest fires), Man-made illuminations: (city lights, beacons, gas fires), and now... Lava! The other pilot said it looked a bit like "Lord or the Rings" a dramatic reference to the fictional "Centre Earth" volcano [wiki] and frankly, with an astonished loss of words I agreed. I simply was unprepared to imagine such an eruption that was beyond my comprehension to a scale that had no familiarity. It was truly something new. These 16 Oct 2014 twilight images allow some land features to be seen. Iceland has had many eruptions in the recent past and significant eruptions in modern historical times from several different volcanoes. My very own Great Great Grandparents left Iceland to avoid hardships associated with eruptions in the 1800's. 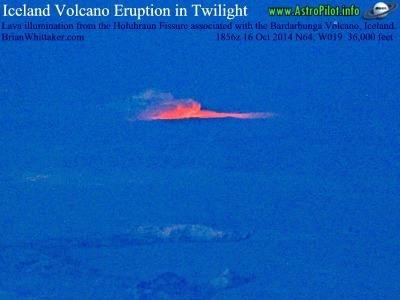 This current lava eruption is coming from a remote area called the Holuhraun [wiki] area, however the lava is not coming from the top of a volcanic mountain, but instead from a giant crack on the ground called the Holuhraun Fissure . It is just north of Iceland's largest glacier, the Vatnajokull Glacier [wiki] on the south-east of Iceland. Underneath this giant Icecap are several volcanoes which occasionally erupt. Most people heard about the Grimsvotn Volcano [wiki] and its copy-cat eruption and Ash Cloud which interfered with Trans-Atlantic airline flights in May 2011[wiki] [dailymail]. 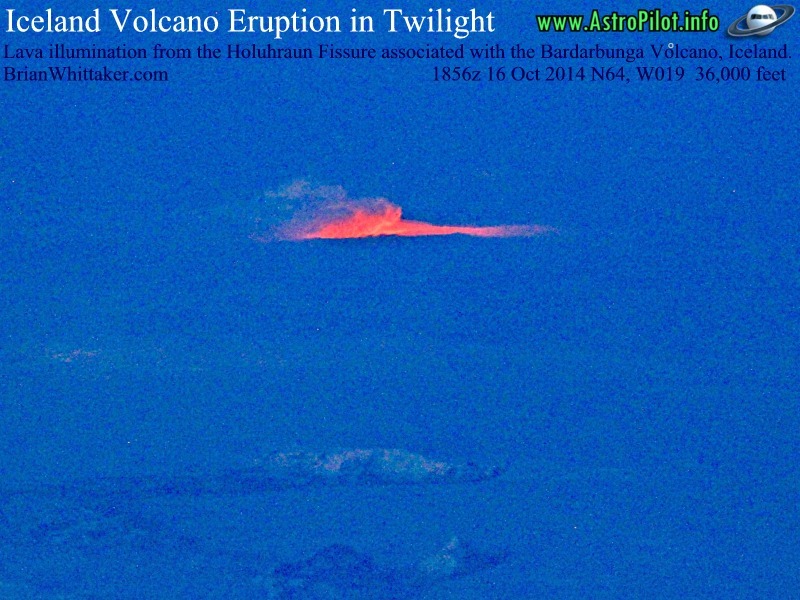 This current eruption is associated with a different volcano, the Bardarbunga Volcano [wiki] which is also underneath the same giant Icecap. 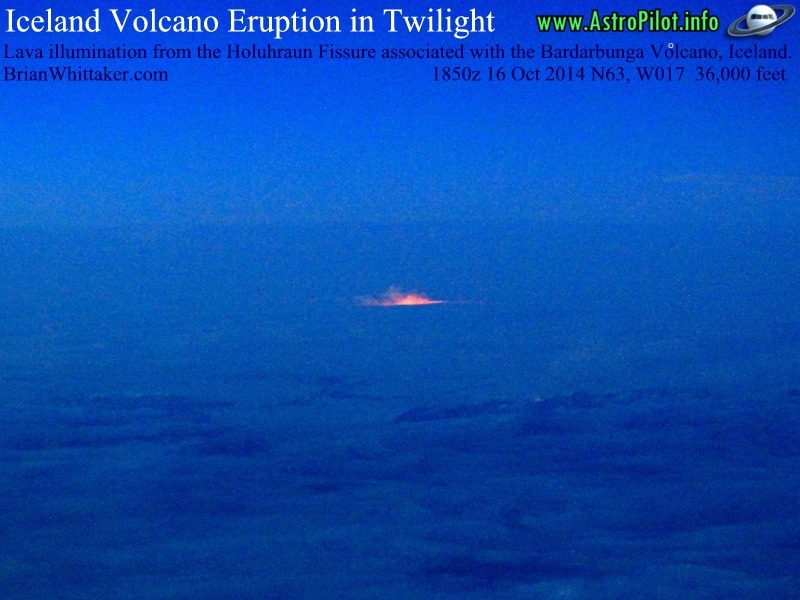 Scientist are able to measure that the Bardarbunga Volcano's Caldera has dropper about 100 feet, which clearly indicates continuing activity underneath the ground. As of the end of October, after two months of continuous eruption, a cubic kilometer of lava has poured out of the fissure with no end in sight. As long as the lava eruption continues to occur in the fissure, away from the giant glacier, then a disruptive ash cloud may be averted. Another volcano, 80 miles to the southwest, is the infamous Eyjafjallajokull Volcano [wiki] which erupted with an Ash Cloud that significantly closed European airspace and Trans-Atlantic airline flights for 6 days in April 2010 [wiki-2010]. Eruptions of Eyjafjallajokull are occasionally linked to the Katla Volcano [wiki] which is overdue for a large eruption which could also affect air travel in the future. 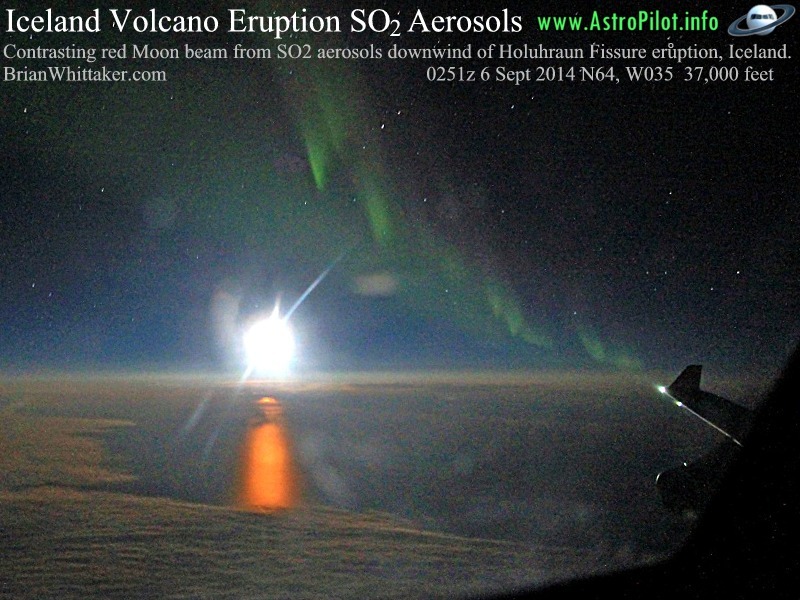 The nature of these volcanoes means that it is very safe to fly in their proximity when authorized. Iceland monitors the region very meticulously and responds immediately to any changes. The current eruption, as of October 2014, has no high altitude ash associated with it but is releasing low level poisonous gases [forecasts-gas] which cause risk to people nearby on the ground. Consequently, because of its remote location in Iceland, most Icelanders have not seen this impressive eruption in person. 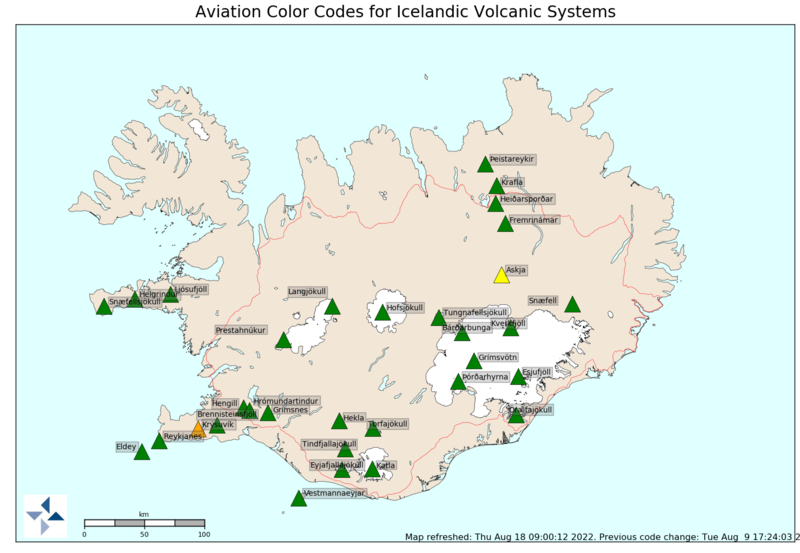 I asked the Reykjavik Air Traffic Controller if he had managed to see the eruption and he informed "no" that the entire area is off-limits to everyone except scientists and journalists. 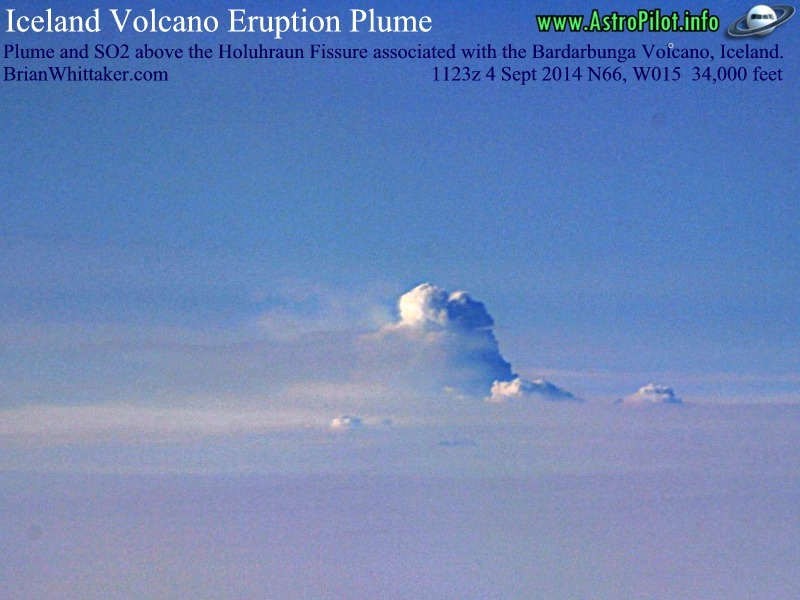 Above is a high altitude steam plume over the Holuhraun Fissure Eruption. 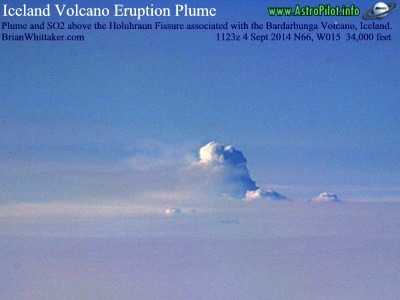 It is not a typical volcanic plume of ash but rather a convective cloud of steam and SO2 gasses. Coincidently, large summer forest fires are also able to create similar convective plumes simply from their own heat which can occasionally precipitate rain like a thunderstorm. Canon 60D. (N64.90, W016.75 map). 4 Sept - 16 Oct 2014. Photo: (c) 2014 Brian Whittaker (.com) . See fair use policy.